Dave Sifry of Technoratti has posted part two of his state of the vlogosphere presentation. A follow up from his web 2.0 conference in October. Yesterday he revealed that the number of blogs has once again doubled in 5 months as it has now been doing for 5 straight months. Today is where the truth comes out though. The number of actual posts. It's hard to compare growth over the last five months. It's been chaotic and there was an initial downturn of tremendous proportions after the US election. However you can safely say that in the last 12 months the number of posts has quadrupaled, perhaps more. From around 100,000 posts per day in March 2004 to approximately 500,000 post on March 5th of this year. There have been some recent spikes and declines but that's a 4x to 5x's growth all the same. A much more accurate portrayal of growth in the blogosphere than just the number of blogs. Much more interesting is the spikes in traffic due to events such as the SuperBowl, the US Election, the political conventions, the Howard Dean Scream, the Nick Berg beheading, and the Kryptonite Lock controversy. His synopsis is by no means thourough on the events that sent ripples through the blogosphere, but one thing is certain... the blogosphere definitely loves it's own stories. Kryptonite locks do not mainstream news make, yet the spike double spike was tremendous. It'll be interesting to see what sort of stories the vlogosphere favors when it's analyzed a little more. I hope we'll be seeing more on this from Dave. Tomorrow: "how blogs are capturing attention compared to mainstream media sites, what news sites are being referenced the most, and how that has been changing over the last few months"
...and say thank you. Dave doesn't have to put this info out publicly, but he does. Thanks Dave! "On average, Technorati is tracking about 500,000 posts per day, which is about 5.8 posts per second. In October 2004, we were seeing about 400,000 posts per day. It is interesting to note that posting volume suffered a decline during the months of November and December, 2004. A large part of this decline is the reduction in postings about US politics after the election in early November. However, the growth of mainstream blogging services becomes apparent when looking at the rise in posting volume starting in December. This is congruent with the increase in the number of new blogs during those months as discussed in yesterday's entry. It is also interesting to watch the spikes in the graph that have accompanied major news events. I haven't done a detailed analysis here but picked out a few spikes that stood out to me. The graph shows the effects of events like the US Political conventions and elections, the Indian Ocean tsunami, and the US Super Bowl. It is important to note that with major events like these, the actual amplitude of the spike is less relevant than size of the spike above the ambient amplitude level. 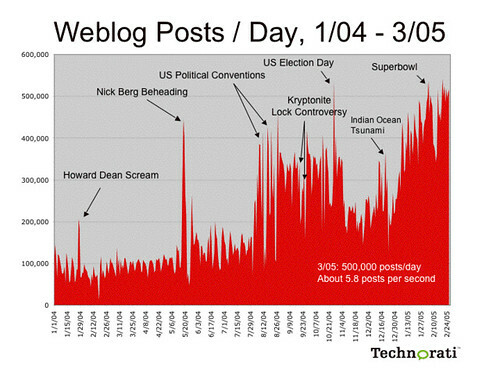 In other words, even though there were fewer posts on the days following the Tsunami, it had a much larger spike than the one that came the day of the Super Bowl. I'm sure there are numerous international events that show up as spikes in this graph, as the number of postings made in non-english languages is now about 40% of the volume of postings that Technorati is tracking."